On Monday, Apple released the iPhone SE, a new iPhone that's just like its current iPhone but smaller. It was a modest release compared to the iPhone 6S. But compared to the three-year old iPhone 5S, which the SE is replacing, Apple's new 4-inch iPhone is a major improvement. Is it just a tiny iPhone 6S? Apple has taken much of the latest generation technology from the iPhone 6S and put it inside the SE. It has the same A9 chip and M9 motion processor, an NFC chip, and the same faster LTE and 12-megapixel camera. Some things are missing, however. There is no barometer sensor in the SE and the fingerprint sensor is older. The front-facing camera is not as high-quality. The biggest feature missing from the phone is 3D touch, the heavily hyped pressure-sensitive touchscreen technology introduced with the 6S. Sorry, I don't speak specs. How is it better than the 5S? The iPhone SE takes better photos and videos. It can take Live Photos, those cute video-picture hybrids that are like fancy GIFs. You can also use the phone to buy things like candy bars, coffee and gas using Apple Pay. Apps and websites will load noticeably faster. It has the fun "Hey Siri" feature, which lets you trigger Siri with just your voice. But it looks different, right? On the outside, the iPhone SE looks almost exactly like the iPhone 5S with a few very minor tweaks. But if you're the kind of person who drops the word "chamfered" in casual conversation, you might be excited by the phone's design. The chamfered edges -- the angled edges that border the device -- are now matte instead of shiny. 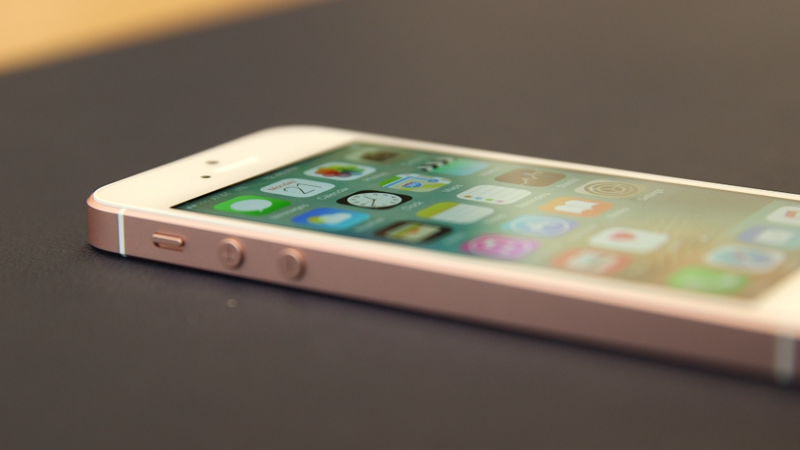 Like the 5S, the SE comes in gold, silver and gray, but it is also available in rose gold (that's Apple-speak for pink). On the back of the phone, the Apple logo is stainless steel, and the letters "SE" are printed at the bottom as a constant reminder of specialness. The upside of so few changes is that you can pop the SE into any existing iPhone 5 or 5S case. Why would someone want a smaller phone? People with small hands have reported finding it difficult to navigate larger screens with just one thumb. The 4-inch phone fits more easily into small pockets, and there's less danger of dropping it. This could appeal to someone working in a dangerous environment, say, an offshore oil rig. Smaller also means cheaper. The iPhone SE starts at $399, making it the most affordable iPhone option. If you have a four-inch or smaller iPhone and are perfectly happy with its performance, don't give into corporate peer pressure! Like all hardware companies, Apple wants people to be on a regular upgrade cycle, abandoning older phones and paying for the shiny new kid on the block every other year or so. The iPhone 5S was a perfectly good phone. The number of people sticking with their old four-inch devices may not just be a case of size-preference. What if they're just content and don't want to pay hundreds of dollars for a new device they don't need? Power users might jump at the chance for more speed or new features, but many regular people probably won't notice the absence of something like Live Photos. However, the iPhone SE is noticeably faster and zippier to use than the 5S. For the small handed and tiny-pocketed among us, that's enough of a reason to upgrade.